I truly believe in fate and it was a serendipitous moment when Inesiene jewellery crossed my path back in November. After my annual months leave, back home in the Cotswolds, working for charity, I was on the train en-route to London when a friend spontaneously invited me to the Hervé Léger London Boutique for an evening after-hours. On display in the boutique was a selection of jewellery by Inesiene, designed by Ines Nieto. 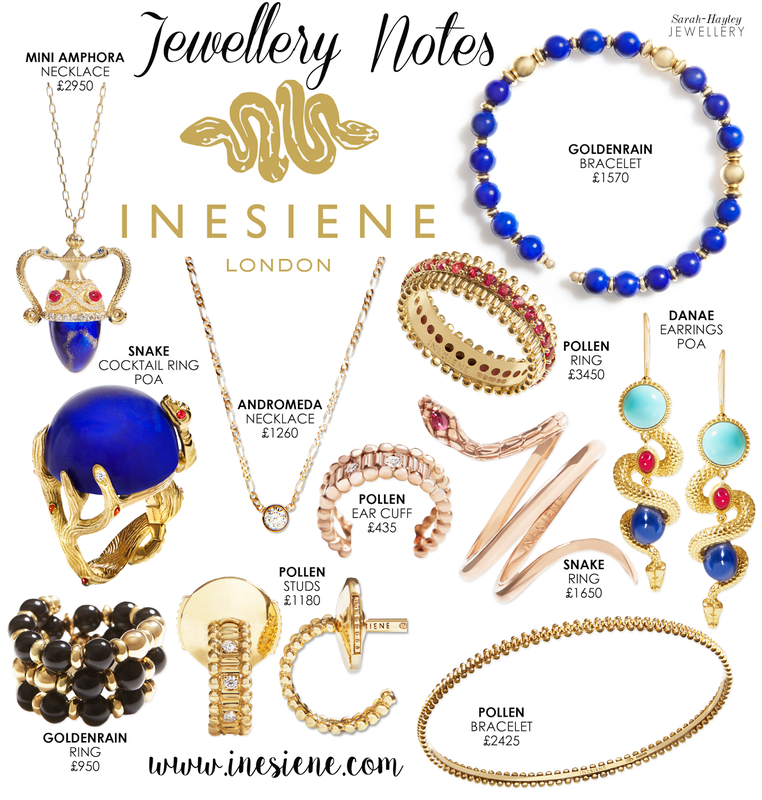 Ines's collections are entirely unique, inspired by ancient Greek mythology and created in the prestigious Hatton Garden, using the most skilled craftsmanship. My favourite piece is the 18 Carat rose gold snake ring with ruby cabochon and sapphires. The snake is a key motif in Inesiene's Danae collection. When I visited The Victoria & Albert Museum for the Savage Beauty press launch I spent a few hours looking through their extensive jewellery exhibits. Classical Greek culture had a powerful influence on the Roman Empire, which spread to parts of the Mediterranean and Europe. Spiralling snakes and serpents featured prominently within roman jewellery because snakes symbolised healing, including the Egyptian goddess Isis and the Greek god of medicine Asclepoios. Their spiralling form translated easily into rings and necklaces, which would be worn as a charm, to protect its wearer. The Inesiene snake spirals elegantly, with a contemporary quality and the pear shaped ruby cabochon adds a subtle hint of colour. What I admire most about the Inesiene is that nothing is excessive or overdone. Each piece has a pleasing grace, perpetually tasteful.